If you’re new to Type One Diabetes, or you’ve been living with it for years, but you’d love to learn more ways to help yourself live more easily with the condition, then check out these helpful resources below including insightful blogs to follow, medical devices, plus diet and exercise suggestions. Blogs to Follow – 1. Scott’s Diabetes Blog – Scott, the author of this amazing blog, has been living with diabetes since 1980. His blog is insightful and helps people that are new to Diabetes or have been living with it for over 3o years like himself to better understand how to go about daily activities and to stay encouraged. 2. Diabetes Mine – This award-winning blog has been around since 2005 and gives lots of insight to people who’ve been living with Diabetes for quite some time. You’ll find a funny section and test kitchen where you can watch trial and error videos for new diabetes-related products. 3. Six Until Me – The writer of this blog was diagnosed with Diabetes at the age of six; hence the name. With a focus on helping younger people understand Diabetes and get the information she didn’t receive at a young age, she’s created a rich blog full of challenges, memes, and valuable resources. With all the wonderful advances in technology over recent years, there are a lot of useful medical devices available at affordable prices for people living with type one diabetes. Omnipods are popular little devices that serve as insulin pumps to many across the globe. Omnipods are waterproof and easy to use. Additionally, in the past 20 years, the development of medical ID’s in attractive styles that people will actually be excited to wear has increased immensely. Diabetic bracelets and necklaces can be found in a range of styles and materials that look fabulous on men, women, and kids. One of the most beneficial practices you can instill for anyone living with Diabetes is to take care of your health through exercise and a well-balanced diet. You want to make sure you’re choosing the right portion sizes for you and you’ll want to limit your sugar intake as much as you can. Set up an exercise plan that you can stick to. Even if it’s just walking for 20 minutes a day, those days will add up and help to provide you with stress-relief that ultimately leads to wellness. If you’re obese, losing weight can potentially help add years to your life span. Life with type one diabetes is not without challenges. In order to make it a little bit easier, we suggest education first, followed by organizing your daily activities with the right medical devices and a beneficial diet/exercise plan. If you can focus on all these areas, there’s a strong chance you’ll end up feeling better and will begin to be able to help others who were facing some of the same challenges with Diabetes as you once were. Our 5 Most Popular Diabetic ID Bracelets Under $30! 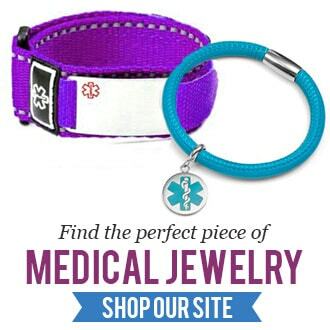 Quality Medical Alert Bracelets for Under $20!